As those of you who follow the other blogs and are part of Team 100WC, last week was manic but really, really successful for the 100WC projects (this one included) It involved presentations at the influential British Educational, Technology and Training Show at Olympia in London and not much sleep. I tell you this to explain why I have not yet got to your entries BUT I WILL! 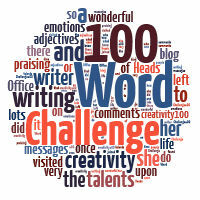 Obviously the same rules apply – 100 words only, PG suitable and of course being constructive not nasty! The link will be open until Monday 23rd. For those who are new to this challenge please read the information HERE. Do get back to me if you have any questions! Click here to enter your link and view this Linky Tools list. As usual, let me know when you have posted and I’ll move your entry to this page as soon as possible! Full House – everyone gets a review! My mindset is just like in kindergarten – everyone gets a balloon. I’m gentle and sweet, so there’s no need to fear harsh words or tears. It was clearly one that challenged in more ways than one! Julia, while this feels like a good idea to me, I think I’ll sit this one out. I think many writers (many people) have a hard time distinguishing between criticism and critique. Sometimes criticism is offered in the mistaken belief that it’s helpful. And often critique is felt as an attack. When I joined into your 100 Word Challenges, I thought critique was a large part of what they were about and I prepared myself for it because I welcome polite critique on my work, whether it feels good when I hear it or not. Often with your challenges, I get the feeling that honest critique won’t be welcome. Without knowing what this week’s challenge would be, I tried to be helpful to Ottabelle on “Blue Engagement” because she made it clear that critique was welcome. Unless someone asks me, I don’t feel comfortable saying more than I already have in their comment sections. Thanks for letting me know Re. I did think long and hard before posting it. We’ll see what comes up. Fingers crossed we don’t lose too many!! Hi Ré. There are a few of us who felt like this. We were worried about selecting a piece for critique in case anybody took it personally/got offended. You’re right in that some people who take part really do want to do it just for fun. We’ve got round it by getting permission from the writer first, so we know that nobody is going to get upset. Just a thought for you in case there’s ever a similar challenge. I think that this is a very interesting idea; however it is going to be difficult to leave comments on these (critiquing the critque!!) Of the ones I have read so far, I’m not sure how helpful a follow up comment is going to be. What do you think? It’s my way of popping in to see everyone but each to it’s own. That was tough, but as with any good exercise, I’m happy it’s over, and happier that I did it. I’m number 2 on mister linky. Pingback: A Critique of “Drowning (A Story)” for the 100-Word Challenge « Does writing excuse watching?